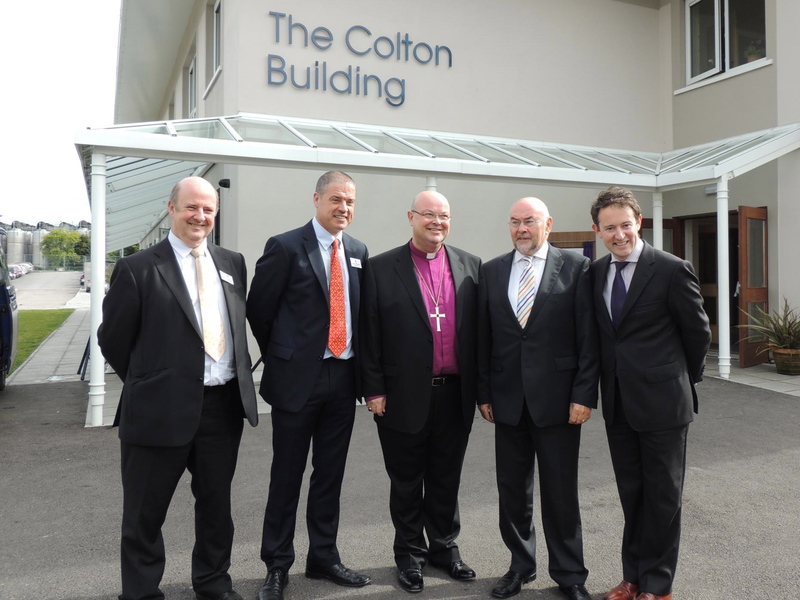 At the opening of the Colton Building (the new academic building at Midleton College, Co. Cork): l-r Deputy Principal Bud Morrissey, Principal Simon Thompson, Bishop Paul Colton, Minister for Education and Skills, Ruaírí Quinn T.D., and Minister Séan Sherlock T.D. Friday 21st September was an historic day at Midleton College, Midleton, County Cork, as Minister for Education and Skills, Ruaírí Quinn T.D., officially opened The Colton Building, named by the Governors in honour of the Bishop of Cork, Cloyne and Ross. This major new capital investment was co-funded by the DES and Midleton College. The new facility provides state-of-the-art Information Technology, Home Economics and Project Maths rooms. In addition specialist Spanish, History, Geography and Religion classrooms are located within the building. Lockers, circulation space and bathrooms for students are also situated in ‘The Colton Building’. Principal, Simon Thompson, said that the new facility is named ‘ … in recognition of the outstanding leadership given to the governing Boards of the College by our Chairperson, Bishop Paul Colton. His vision, commitment and determination to ensure that the College’s proud history of education and pastoral service to the community is allowed to flourish into the future underpins the confidence of the Boards in supporting this major investment.’ In thanking Minister Quinn for officiating at the opening, the Principal thanked also all those who have served the College in professional or voluntary capacities and acknowledged their part in building the College’s reputation for academic and pastoral excellence. Minister Quinn noted the ‘palpable engagement of students and teachers in their work’ during his visit. The Minister said he believed that Midleton College can more forward with confidence into its fourth century of education, a record almost without parallel in Ireland. Bishop Colton, expressing his pride at the naming of the new building, stated he accepted the honour on behalf of all who work, study and live at the College and make it the outstanding and unique school that it is. Minister for Education and Skills, Ruairí Quinn, T.D. 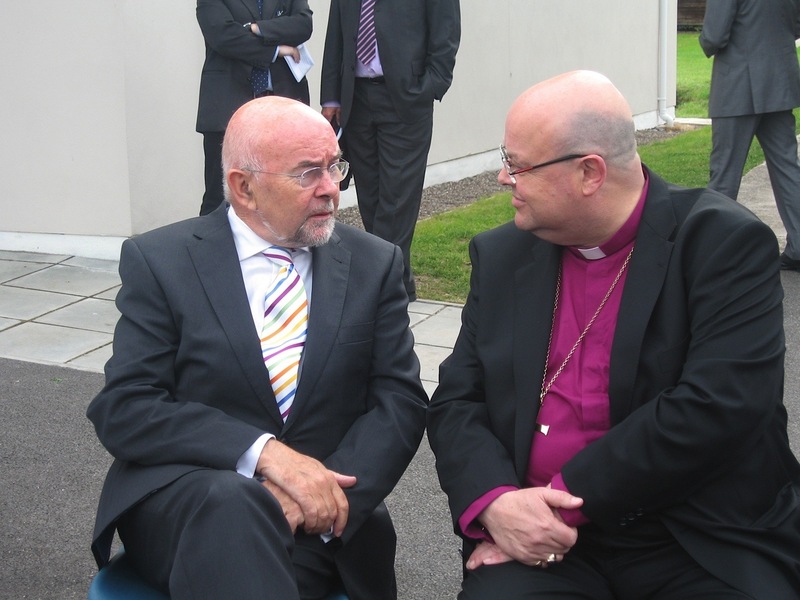 chats with Bishop Paul Colton before the opening of The Colton Building at Midleton College. This entry was posted in Bishop, Cork, Schools in the Diocese. Bookmark the permalink.